When did you first begin to form a connection with your surroundings and the environment? I was born in Spokane, Washington, a beautiful place, but no one knew that the local nuclear-weapons-making site was polluting the local groundwater, rivers, and food supply (and would eventually become the largest Superfund toxic clean-up site in the country). Not my mom and dad, or me, in utero. 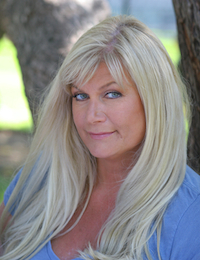 It would take many years before I was finally diagnosed with a disease inherent to exposure to high levels of radiation—hypothyroidism—even though I had a goiter that was visible from birth, since there were no heritability factors, my pediatrician did nothing about it. So, I went on with my life, usually feeling a little spacey, sometimes downright ill, and emotionally fragile, to be sure—but in that fragility, I believe my internal communion with nature was born. You see, I literally had to rely on my sense of nature, my intuition of what was around me, to survive. Some MDs I’ve spoken to say I shouldn’t have lived beyond a few years with a severely impacted thyroid. But live I did, and I’ve always been innately compelled to protect the environment. At eight years old, I wrote my first of many activist letters, this one to the editor of the Minneapolis Star Tribune, demanding the conservation of forests. Still, because my hypothyroid went untreated until I was an adult, my development was slow, and compared with my peers, I’ve done everything … late. I got married late, got my doctorate in psychology late. I had a child late. And, finally, I’ve written my first novel, Falling Into Green, late. But, then, late is better than never. And as for the green movement in the United States, where a cohesive environmental policy is so late in coming it sometimes seems like it will never happen—it will. I feel I can help stand testament to that. How did you come up with the idea for this book, and how long did it take you to write it? Did you have a special routine or place in which you wrote? Falling Into Green is a novel that has swirled inside my mind for years. I’ve always wanted to write something that would compel readers to engage with, and maybe even be entertained by, ecology. Finally, with this eco-mystery, I believe I’ve found a way. My muse is one of the most unstable geological formations in the northern hemisphere: the Palos Verdes Peninsula and Portuguese Bend. When my son was born, I desperately wanted him to have a relationship with nature, and in Los Angeles, with its ever-expanding crisscross of concrete, that can be hard to do. When we moved south of LA to Palos Verdes, I got to spend remarkable hours each day with my toddler on the peninsula, exploring plants, trees, and relishing the turquoise coast. When my son began school, I let the land take up my imagination, and the character, Dr. Esmeralda Green, who ceaselessly and happily adapts to the transformative ecology, was born. What is Esmeralda Green’s relationship with nature? She’s able to immerse herself in her environment. She has the ability, both innate and learned, to integrate psychology, ecology, forensic evidence, and emotion so she can understand the wholeness of something—for instance, a crime. How can a person achieve a relationship with nature? Nature isn’t static, it’s fluid, and sensory, and in our highly structured perception of the world, we lose those connections to something that runs like a river through us, rather than a dam. To go out in a place of nature, even a small park down the street, and simply breathe is probably the first step to getting back in tune with a healthy appreciation of the environment (and subsequently, oneself). Then, to model it in a way; to immerse oneself in the kind of freedom that only ecology can offer. We have to remember nature is meant to be free—unpredictable, and frightening at times—but also a growing, living entity—just as we are—so get out in it and breathe, have fun, and let your endorphins run wild. Do you ride horses like Esmeralda Green does? Not so much anymore, but I grew up riding Western saddle, and my parents in Minnesota own, along with a wonderful trainer, a thirty-five acre working stable. I think respect for horses runs deep in my family’s blood—we love them. What is the inspiration for Ez’s house—not only its family history but also how it’s slipping from the land? I wanted Ez to symbolize the human ability to change—to adapt. We really are so adept at that, and yet, beginning with the shift from hunter-gatherer to agrarian to industrial to technological, we’ve become progressively hardwired in our thinking, particularly about nature. It could be said that throughout history, our species has strived to control nature by predicting it to protect ourselves—but as we see on an almost daily basis, nature is getting harder to predict, and thus protect against. So once more, our ability to adapt in the face of challenge becomes important. Ez’s flexible perspective on adapting her beloved ancestral home, a home her grandfather built himself, to the slippery slope beneath it is actually a tribute to our ability to recreate ourselves. Ultimately, for Ez, the only way she can keep her home is to let it change, and to change with it. Ecopsychology, or green psychology, is a groundbreaking psychological theory that goes so far to include nature in the development of the human psyche. Whereas many theories in psychology have not included an external force in the development of ego, superego, and id, ecopsychology stipulates that nature is inherent to the formation of an individual’s perception of the world, and his or her response to that world, whether it’s functional or dysfunctional. As human beings, we often reflect what we see and what we experience, and when we are constantly barraged with trash, concrete, pollution, smog, waste—our behaviors will often mimic those very things. I think it’s no coincidence that we’ve adopted the word “toxic” into our cultural vernacular to describe negative behavior. We don’t realize the abusive relationship we sometimes have with nature on a personal level. And we often help to facilitate a larger entity, an organization or industry in an abusive relationship with nature because … it’s easier. Then, we don’t have to face our own stuff … our own personal responsibilities. And again, like any abusive relationship, it could end up killing us. How/when did you first realize you wanted to specialize in ecopsychology? Ecopsychology led me to psychology, and psychology led me back to ecopsychology. I wouldn’t have studied psychology had I not read a book titled Ecopsychology, by Roszak, Gomes, and Kanner, which struck me to the core of my being as authentic. I’ve always been an environmentalist. I remember, as a three-year-old, playing at a small, mossy bank in our backyard that was teeming with green and tiny creatures, and I felt, even then, a kinship with that natural world. I spent my life advocating for nature on some level, whether it was campaigning through my neighborhood for dolphin-safe tuna, or getting into semi-brawls with the hunters in Minnesota. I even used to forgo driving a car while living in Los Angeles, of all places, taking the bus and carrying my groceries home in a duffel bag. I finally bought a Geo Metro, which got roughly 50 miles per gallon, and kept that car until the Toyota Prius was available. Now, our family has a Ford hybrid. So, I studied psychology to understand ecopsychology—to be able to integrate the two theories into one. That is ultimately what ecopsychology’s about—the integration, the connection between all things: the “me” and the “other.” Nature and nurture. Everything’s connected. Why is ecopsychology an important field right now? Well, if we go with the idea that everything’s connected, then in taking that one step further: What are we connected to? What are we connected by? Are we connected to each other and our earth in a healthy, sustainable way? Or is it an unhealthy, unsustainable way? I think we all have a pretty good idea of what our world and our connection to it looks like—and feels like—in the twenty-first century: unhealthy. And our behaviors are manifesting that unhealthy connection. I often liken this relationship to the child who grows up in a domestic abuse situation—the learned behavior is abuse, so the child grows up and abuses or is abused, and the pattern repeats to the point at which we have a very clichéd phrase in our cultural vernacular to describe that learned behavior: the cycle of abuse. Well, taking that into the greater world, our learned behavior in our home, the earth, has been for millennia one of abuse—and when we grow up, we abuse the earth or become victims of abuse (i.e., victims of carcinogens in our water, food, etc. ), and we’re willing to accept it because that’s what we’ve been taught—that’s our learned behavior. If we want to survive—as individuals and as a species—we need to break that cycle of abuse we practice toward nature. What advice do you have for those suffering from “eco-anxiety” and concerns about the environment? Break the cycle of abuse! Most anxiety disorders stem from feelings of lack of control of one’s own life, so recovering from eco-anxiety must be about taking control and “changing the world.” I know that term is bandied about a lot these days, but change really is the key, whether it’s in reference to a domestic abuse situation or an eco-abuse situation—take the first step, whether it’s buying organic, buying local, driving a car that gets better gas mileage, or urging your community, school, or workplace to adopt green standards. People told me for years that I was crazy when it came to being concerned about the environment. I can’t tell you how many times I was laughed at for taking the bus in LA. Now, those same people take the bus, or drive a hybrid, or a ride a bike to where they want to go—because they’re experiencing the ravages of climate change, the volatility in weather, and, unconsciously, the manifestation of volatility in human behavior—and they want to do something about it, to initiate change. 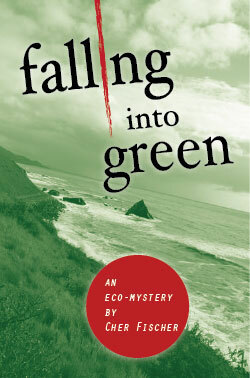 Cher’s eco-mystery, Falling Into Green, is now available at Amazon, Barnes & Noble, and your favorite indie bookstore, as well as on the Kindle, the Nook, and in the iBookstore.